Damien Hirst created art of out animals in formaldehyde and Chris Ofili incorporated elephant dung in his painting of The Holy Virgin Mary. But now an Oxford University scientist is part of a small US movement taking unusual art media to a microbial level. 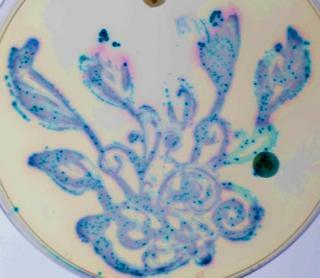 Dr Nicola Fawcett creates art using bacteria found in the human gut and harvested from faecal samples. Ms Fawcett creates her "agar art" using a mixture of three common gut bacteria to create a kaleidoscopic tree-effect. The "chromogenic agar" on which the bacteria is developed changes colour depending on what is present. Purple shows E.coli, turquoise Citrobacter and the dark blue a tiny amount of a multi-drug-resistant klebsiella. The bacteria was stamped onto the agar, and then left to grow overnight. Each small round dot is a bacterial colony of a few million individual bacteria, growing together. Ms Fawcett, who is part of the Modernising Medical Microbiology research group at the university, said her artwork also carried an important message about living with bacteria. She said: "A healthy, desirable world is portrayed as one free of bacteria - sterile and scrubbed clean. "It's increasingly clear that this isn't true and that we need bacteria in order to survive. "One of the most important places this happens is in our partnership with the bacteria in the gut." "The artwork was created to help draw attention to the research we are doing into gut bacteria, how they are affected by lifestyle, healthcare and by antibiotics, and what that means for our health." Ms Fawcett created her art for the American Society of Microbiology Agar Art competition.